I have often wondered about living in Cebu. 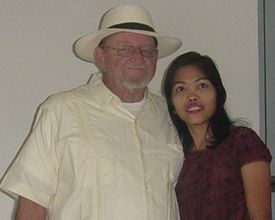 I am Jerry, 62, from Phoenix, Arizona, USA. I just retired on Sept. 1, 2006 and, due to a spotted work history and early retirement, my SS income will be in the lower range of the generally considered “required to live income” for a foreigner in the Philippines ($600 per month). On September 13, 2006, I left from Dallas Airport on the trip I had planned for more than a year. My quest was to relocate for a time to Cebu City and to enjoy the company of my honey, whom I had visited one time for a week and chatted with nearly daily for the last 2 years. I arrived in Cebu City on Cathay Pacific from L.A. on schedule, September 14 about noon. I cleared customs and the visa process, which went very smoothly, if not rapidly. (The facility in Cebu City is not geared to very large flights.) However, in less than an hour, I was outside, looking for that radiant smile and those sparkling brown eyes of my Filipina princess living in Cebu . The reunion was again not swift but accomplished after the short delay required for her to fight the crowds and get to my location. Step 1 was complete: I was now safely encircled in the loving arms and care of my honey. We had reservations at the Fuente Pensione House ($20-$40.per night, walking distance from Robinsons mall), so we hurried off because I was now 36 hours without the benefit of shower and other facilities. We rested and took a light dinner in the upstairs restaurant and bar. The next day was fully scheduled for visiting some Internet cafes I had been associated with because of my website. My schedule was shortly useless, as the travel time was much greater than the allotted times for the visits. (A very short distance on the map can take 30 minutes.) The first day was enjoyable, but frustrating, because I had planned my first few days to be fruitful and financially productive. They were neither—they were just frustrating and exhausting. After a couple days of this we rested a day and begin to search out a less expensive, more permanent home. An associate pointed out a subdivision on Mactan Island where reportedly a house could be purchased for $150 per month. We spent a day with the realtor, only to discover that a new house there is bare walls and floors and nothing more. The down payment was ridiculous, and the agreement would have required a Philadelphia lawyer a month to untangle. This was also aggravated by the fact I was an "American" and my honey hadn’t been gainfully employed for the last 5 years. The house sits halfway up the side of a mountain, but there are paved streets. From what I could see it was roughly 500+ sq ft., with two small bedrooms, a larger living room/dining area, a “dirty” kitchen and a separate shower facility. One bedroom had an air conditioner (an absolute requirement when living in Cebu). The front porch is an area roughly the same size as the house with a high steel roof and what was once a cement floor. * My neighbor (two doors down) is Paul. He is a retired navy chief and a very nice guy. He, his very lovely wife, Anna, and Baby Geneva have become fast friends and valued companions. I am confident Anna and Stella have already exchanged all intimate details of the breeding and care of the ensnared "American" pets in their possession. * The people living in Cebu smile constantly. When passing a scene which makes me cringe with anxiety because of the obvious poverty, the children will be laughing and playing with a rock and a stick, and the adults in residence will be laughing and smiling and in general apparently oblivious to their plight. * The only exception to the everybody smiling rule is the beggars. They have chosen their profession because of how pathetic and sad they can appear upon demand. * Public transportation while living in Cebu requires a lot of walking. I have arthritis and this presents some obstacles. * Lizards are horny creatures and make weird noises, day and night, trying to attract their next lover. * Cats and dogs are sorely mistreated as are the children and the “poor”. * Horns are incessant. They are sounded when approaching any corner as a warning to other travelers or at any animal or obstacle in the roadway ahead. They are sometimes sounded to attract the attention of “cute” pedestrians or for no apparent reason at all. The only time a taxi driver stops sounding his horn is while passing a catholic church or shrine. He then removes both hands from the steering wheel, bows his head and crosses himself. I guess this is to obtain absolution for his many transgressions committed since the last church or shrine some 100 yards before. * That a microwave in the Philippines is a luxury item, and the most stripped down model will set you back $125. Your taxi driver has a twin cousin or brother who drives this same taxi. Any deal previously made is null and void with this driver. Confirm any requirements and expectations with this driver at the time you get into the taxi. Drivers can become very animated and angry over even 25 or 30p. Don’t do this! I met an American living in Cebu—we will call him Dean. He is bright, thirtyish, and married to a Filipina with a baby. He came here with a one-way ticket and a small savings, expecting to be able to support himself, wife, and baby here with his wit, cunning, and small capital. He invested his capital in some TVs to sell and rent. He is now broke, penniless, and desperate. He now lives, very primitively, in one room without convenience. He tries to survive off the generosity of foreigners he is able to find and whatever work he can find at any pay rate. He must compete with Filipinos who are also broke, penniless, and desperate. If you can’t afford a return ticket before you come here, how will you buy one after you get here? If you don’t have some sort of perpetual income source or a large capital base you are doomed. Love is blind, but true poverty when it involves someone you love is a hard smash in the face that brings you to the blinding light of reality. Dean’s plight tugs my heartstrings, but I must responsibly preserve what safety net I have and keep my already meager budget for my own needs. Again I caution, don’t do this, no matter the degree of wit or cunning you may possess. You are no longer in Kansas, Toto! My first month here has included finding and losing a job. A break in my generally good health requiring a visit to the hospital, a subsequent upper GI, and numerous expenditures for prescriptions and other unexpected expenses. I have found my first month living in Cebu an adventure and truly the most enjoyable of my life. I may return to the U.S. to better prepare myself to live here. But don’t be mistaken, I shall return. I have not even touched on the joy I receive from my Filipina or the utter satisfaction in the day to day dealing with the Filipino people. I can’t explain the contentment I feel here. I can only say, “I have been smitten by the Philippines”.